The prompt reporting, investigation and remedying the root cause of incidents , non-compliances, near misses, injuries and property damage is essential in improving environmental performance. All operational areas and activities must be inspected on a regular basis to ensure that operational controls are effective and identify improvement opportunities. Robust processes for ensuring preventative and corrective actions to address identified deficiencies of probles is fundamental to improving performance. Senior Management are critical in the development of the Environmental Management System, Risk and Opportunities Register, and the support of actions designed to remedy and meet Environmental and Community Relations objectives and targets. Policy details the operation’s level of commitment in both a general sense and specifically to the aspects most relevant to the site. It always includes a commitment to continual improvement, polution prevention and waste reduction. The Risk and Opportunity Register is a relative ranking of the risks and operational activities impacting on known environmental values and the opportunities to mitigate those risks. It is a basic tool for the prioritising and allocation of resources to areas of greatest need. The Legal and Other Requirements Register details the Legal obligations of the organisation and any other obligations that the organisation may have as a result of being a signatory to a code, convention or similar. These are the targets and standards that the organisation sets to fulfill policy commitments, meet or exceed minimum legal requirements and to mitigate significant risk. Environmental Improvement Programmes are planned and budgeted projects that will improve the facilities and ultimately enable environmental and community relations objectives and targets to be achieved. The communication system procedure details the processes the organisation uses to communicate environmental and community relations issues to the workforce to improve environmental awareness and performance. It also encompasses the process of external communication used to retain the confidence of the community and regulatory authorities. 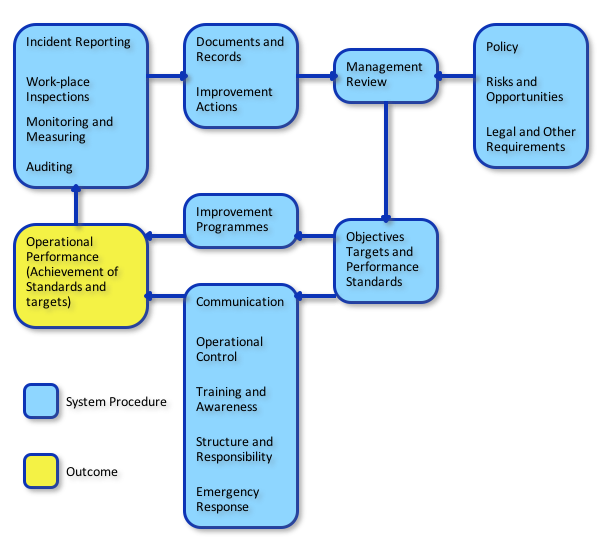 Operational control encompasses the processes of establishing standard operating procedures that effectively consider, manage and control significant risks in all operational activities. Employees and contractors must be aware of their individual environmental and community relations obligations and responsibilities. Competency in these areas must be demonstrated. Environmental and community relations responsibilities are delegated to all management, employees and contractors through the inclusion of specific environmental accountabilities in job descriptions and contract clauses. Environmental and community relations emergencies must be anticipated, prepared fo and effectively responded to.